There can be few occasions in life more fulfilling than those on which debts of kindness and friendship can be repaid. These past few months have furnished me with many opportunities to thank peoples and organizations and governments for their staunch support for the democratic cause in Burma and for me personally. The sympathy and understanding we received from around the world enabled us to continue with renewed vigour along our chosen course in the face of immense difficulties. Words of thanks alone are barely an adequate return for encouragement and help given in generous measure when we were most in need. Today, I wish to thank you for the Jawaharlal Nehru Memorial Prize that was awarded to me in 1995, the year that I was released from my first term of house arrest. The links between the independence movements of our two countries and my personal ties to India imbued the prize with a special meaning for me. The thoughts and actions of the leaders of the Indian independence movement provided me with ideas and inspiration. 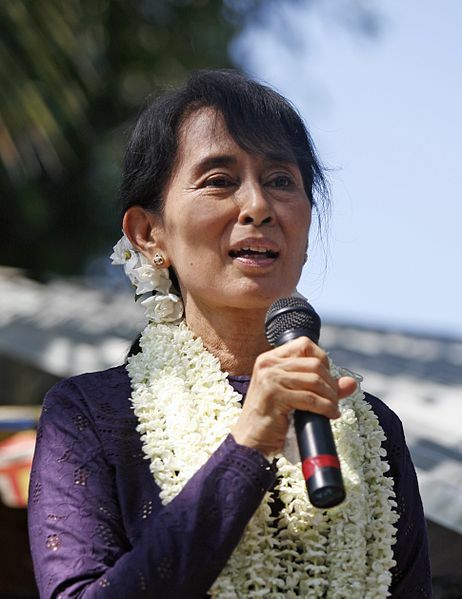 Our movement for democracy in Burma is firmly rooted in the principle of non-violence that Gandhi made into an effective political force even against the most powerful opponents. His influence on my political thinking is widely recognized. The influence of Jawaharlal Nehru on my life in politics is less well known. “Panditji” was a name known to me since I was little past the toddler stage. My mother spoke of him as a revered friend, almost a father figure, both to her and to my father. I had little idea of his importance as a statesman beyond the fact that he was the Prime Minister of India. To my infant mind he was the kindly old man who had provided my father with two sets of uniform, the smartest he ever possessed. In January 1947 my father had stopped in Delhi for two days on his way to London for the Aung San-Attlee talks that were to be the first phase of formal negotiations for Burmese independence. He had left Burma in the thin cotton uniform of the People’s Volunteer Organization (PVO). Panditji took one look at the flimsy khaki outfit and decided it would not do for the icy weather of London. He gave instructions that two sets of a warm and smart version of the PVO uniform be made immediately. He decided that my father would also need a heavy overcoat but since there was not enough time to have one made to measure, a British Army issue greatcoat was procured. The most widely known photograph of my father shows him wearing this garment in the garden of 10 Downing Street. My father was still a university student when he first met Jawaharlal Nehru and other Indian leaders. The student unions were at the forefront of the independence movement in Burma and shared aspirations led to ties of friendship between anti-colonial forces in our two countries. However, as the Second World War approached, the paths to freedom chosen by the Burmese diverged from the non-violent way of Gandhi. My father led a group of young men, the ‘Thirty Comrades,’ to Japan for military training and this small pioneer force became the core of the Burma Independence Army. The next and last time my father and Nehru met was in those few days in Delhi that acquired unexpected sartorial significance. After my father’s death, Nehru continued to keep an avuncular eye on my mother from afar. Whenever she went to India or whenever he came on official visits to Burma, he made her feel his concern for her well-being and the well-being of her children. I may even have been taken along to meet him during one of his visits but I can only remember seeing him for the first time at Delhi Railway Station when I was about sixteen. My mother was then ambassador to India and she and I and a small group from the Embassy and the Ministry of External Affairs were waiting to welcome Prime Minister U Nu who was travelling up by train from Calcutta. Nehru also came to meet U Nu and onlookers spotted him as soon as he stepped into the area that was cordoned off from the teeming crowds in the station. Cheers went up and shouts of “Pandit Nehru ki jai” resounded. His lower lip protruding in that famous petulant look, Nehru ignored all the plaudits and all the people (including me) and walked up and down the empty platform with my mother and talked to her exclusively. His aristocratic disdain for public approbation filled me with both astonishment and admiration. I wondered if Nehru’s public liked his cool arrogance or whether there was a bond between them that made exchanges of mutual courtesies unnecessary. Then I remembered that my father had been notorious for his stern, almost scowling expression and for his lack of social graces. Our people loved him for these very defects, which they saw as proof of his honest, open nature. I should add that towards the end of his life my father acknowledged that as a national leader, he could not continue with the rough diamond manners of a young revolutionary. The year I went to Oxford, 1964, was one of the most significant turning points in my life. It was also the year Nehru died. Next to the overwhelming grief of the people not just in India but in all parts of the world, I remember most vividly reports of the poem by Robert Frost found on his desk. Oxford did not take me away from India for I made many Indian friends there. After my marriage, my husband’s work in Himalayan studies took our family frequently to the north of the country. My last sojourn in India was spent as a research fellow in the Indian Institute of Advanced Studies in Shimla from 1987 to 1988. The year of Nehru’s birth centenary, 1989, was the year I was placed under house arrest for the first time. It could be said to have been the year of my political coming of age. When I joined the movement for democracy in 1988 the whole country was in a state of upheaval and my major concern was to try to unite the myriad political groups that had emerged from the cracks in totalitarian rule into a strong, coherent force for democracy. Each day was more than eventful: discussions, debates, public meetings, founding the National League for Democracy, touring the country to explain the aims of our party to the people. The State Law and Order Restoration Council had announced that elections would be held in 1990 and the election laws were made public in April 1989. The Central Committee of the NLD was divided over whether or not the party should contest the elections. I pointed out that the laws made no provision for the transfer of power and that I did not believe the military regime would step down unless the winner turned out to be the erstwhile Burma Socialist Programme Party. We were still undecided with regard to the election issue when I was placed under house arrest in July. The Chairman of the Township Law and Order Restoration Council, an army major, appeared at my gate with a warrant and a group of officers, civilian, military and police, in the morning of 20 July and I thought I was going to be taken to prison. As all members of the NLD had to be prepared for such an eventuality, I had already packed a small bag with the necessities of life in jail. My sons had come for their summer holidays and they understood that I was going to be arrested. When the Chairman appeared at the front door, Kim asked him if I would be kept as an ‘A’ class prisoner or a ‘B’ class prisoner. Somebody must have been talking to him about colonial times when political prisoners were given ‘B’ status, better treatment and more privileges than the criminal ‘C’ class. (‘A’ class was reserved for Very Important Prisoners, such as retired prime ministers.) The Chairman was somewhat disconcerted by Kim’s question and replied that I would not be taken to prison. This was how I learnt that I would be placed under house arrest under a section of the law that had previously never been invoked. House arrest meant that external activities suddenly came to a halt. It was also an indication that our struggle would be difficult and long. I would have to decide how I would chart the course of my life for the foreseeable future. Among the ‘maps’ I used to see me through the years that headed into the unknown were Nehru’s autobiography and Discovery of India. I read the above words of Nehru and made comparisons with my own situation. I certainly did not see the present and the past as inseparable, perhaps because I had access to a short wave radio that kept me in touch with the outside world and made it come vividly alive for me. Or perhaps it was an unlikeness in our attitudes to life that made us view isolation in different ways. Even when I was put into prison briefly during 2003 I never had the sensation that present and past had merged into one. There was of course a sameness to the days but each was separate and distinct, so many different stones in a string of perfectly matched diamonds. I use the diamond metaphor deliberately because each day had to be used to forge anew an adamantine resolution to continue along the chosen path. There was, however, also much in Nehru’s books to make me feel we had many things in common. I was struck by the fact that the very first fragment of poetry he quoted in Discovery of India was from one of my favourite poems, one that had lodged itself in my memory almost instantly at my very first reading of it, Yeat’s An Irish Airman Foresees His Death. Yet even in our liking for the same lines there was a difference. Nehru wrote of wanting to experience again ‘that lovely impulse of delight’ that ‘turns to risk and danger and faces and mocks at death.’ I had remembered the words as ‘that lonely impulse of delight,’ and I could not check to see which version was correct as I did not have the poem to hand. To me, ‘lovely’ changed the entire meaning of the poem. I wished I could have discussed the matter with Nehru himself. Was it not essentially lonely, rather than lovely, to delight in what would seem at least inexplicable if not outright undesirable, to most of those around us? When, after the years of house arrest, I managed to look up the poem I found that ‘lonely’ was indeed the right word. Was ‘lovely’ a misprint in my copy of Discovery of India or had Nehru misread the line? To mull over the meaning of a word, to build a whole philosophy on the interpretation of a poem, these are pastimes in which prisoners, particularly prisoners of conscience, engage, not just to fill empty hours but from a need to understand better, and perhaps to justify, the actions and decisions that have led them away from the normal society of other human beings. To begin with, what exactly is our conscience? My father once spoke about the need to be able to stand confidently before the court of his conscience. But this court, how broad is the range of its jurisdiction? Did it restrict its mandate to our convictions and our public commitments or would it also enquire impartially into the love and care we owe in our private relations, our obligations to friends and families? This is a question that must surely trouble all who, regardless of the condition of near and dear ones, accept distress and danger in the name of a cause or a belief. Nehru explores this dilemma in writing about his wife Kamala. In 1934, while serving one of his many terms of imprisonment, it was suggested to him “through various intermediaries” that if he were to give an assurance, even an informal one, that he would keep away from politics for the rest of the term to which he had been sentenced, he would be released to tend to his ailing wife. This roused a deep indignation in the proud independence fighter. Politics was far enough from my thoughts just then, and the politics I had seen during my eleven days outside had disgusted me, but to give an assurance! And to be disloyal to my pledges, to the cause, to my colleagues, to myself! It was an impossible condition, whatever happened. To do so meant inflicting a mortal injury on the roots of my being, on almost everything I held sacred. I was told that Kamala’s condition was becoming worse and worse and my presence by her side might make all the difference between life and death. Was my personal conceit and pride greater than my desire to give her this chance? It might have been a terrible predicament for me, but fortunately that dilemma did not face me in that way at least. I knew that Kamala herself would strongly disapprove of my giving any undertaking, and if I did anything of the kind it would shock her and harm her. The above passages fascinated me. The monumental egoism: ‘my pledges,’ ‘my colleagues,’ ‘myself,’ ‘the roots of my being,’ ‘everything I held sacred.’ The briefest appearance before an impartial court of conscience before deciding that he would be doing Kamala more harm than good by doing what was repugnant to his principles. And of course Kamala’s own words put the seal of approval on his decision. Yet in full awareness of the egoism and some possible self-deception on the part of Nehru, I have to confess that I wholly endorsed his stand on the matter. After my release from my first term of house arrest, I made public speeches to supporters who gathered in the street outside my garden at weekends. On one such occasion, I spoke of the above episode and urged the families of democracy activists to cultivate Kamala’s fortitude and dedication. Such are the exigencies of dangerous causes. The lesson I really learnt however was not to deceive myself, or others, with the claim that we are making self-sacrifices when we follow our conscience; we are simply making a choice and possibly an egoistic one at that. When we give up what is dear to our hearts is it not sometimes to make ourselves less vulnerable? The ones who make the real sacrifices are those who let us go free to keep our secret trysts with destiny. The lesson Nehru learnt is one we have to learn and relearn, again and again, along the long and difficult journey to goals that can only be won through hard work and perseverance. At the same time, if our hearts cannot cleave to our colleagues, if our loyalty to those who share our values and aspirations becomes strained, or we have reason to doubt their loyalty, we are cast adrift into a wilderness of uncertainty. During one of my periods of isolation, I jotted down on a piece of paper that if I could be sure of one, just one, totally trustworthy, totally reliable, totally understanding, totally committed friend and colleague, who would keep faith with me and with the cause in which we believed throughout the vicissitudes of this existence, I could challenge the combined forces of heaven and earth. In isolation, one tends towards melodrama. When I heard on the radio, suddenly and unexpectedly one day, that the Central Executive Committee had expelled me from the party for the simple reason that I happened to be under detention, I felt myself to be in a curious no man’s land, far away from everything except my own volition. I realized that pressure must have been exerted on the party and that it must be going through a very difficult period. Finally I decided that it was for me to keep faith with my party as long as it kept faith with our cause, regardless of their official position with regard to me. I thought of Nehru’s ability to keep true to Gandhi in spite of serious differences between them and it strengthened my conviction that we had to cleave to comrades and colleagues despite dissension and disagreement. Law and order, we are told, are among the proud achievements of British rule in India. My own instincts are entirely in favour of them. I like discipline in life, and dislike anarchy and disorder and inefficiency. But bitter experience has made me doubt the value of the law and order that states and governments impose on a people. Sometimes the price one pays for them is excessive, and the law is but the will of the dominant faction and the order is the reflex of an all-pervading fear. Sometimes, indeed, the so-called law and order might be ore justly called the absence of law and order. Any achievement that is based on widespread fear can hardly be a desirable one, and an ‘order’ that has for its basis the coercive apparatus of the State, and cannot exist without it, is more like a military occupation than civil rule. I find in the Rajatarangini, the thousand-year-old Kashmiri historic epic of the poet Kalhana, that the phrase is repeatedly used in the sense of law and order, something that it was the duty of the ruler and the State to preserve, is dharma and abhaya – righteousness and absence of fear. Law was something more than mere law, and order was the fearlessness of the people. How much more desirable is this idea of inculcating fearlessness than of enforcing ‘order’ on a frightened populace! Nehru’s words not only reflected my own sentiments exactly but were so entirely appropriate at a time when the State Law and Order Restoration Council was imposing rule by fear in Burma. I hung the sheet of paper in the entrance hall of my house at a place where the security personnel, usually members of the military intelligence, who were my only ‘visitors’ could not fail to see it. At the bottom of the sheet, I wrote ‘Jawaharlal Nehru’ in large red letters not just in acknowledgement of authorship but as a defiant name flung at all who had a warped view of law and order. During the years of house arrest I felt closer to those with whom I could identify politically, intellectually or spiritually through their thoughts, even if they were complete strangers or figures of the past, than to those whom I knew well personally. This I imagined to be a predictable state of mind for those incarcerated with nobody except their own conscience for company. What I had not expected was that such a state of mind would become as firmly rooted as the tree of life that joins the ground of everyday activities to the heights of aspiration. Gandhi once said that Motilal Nehru’s most striking quality was love for his son: “Motilal’s love for India was derived from his love for Jawaharlal.” This comment led me to wonder if my love for Burma derives from my love for my father, whom I do not really remember. His image for me is inseparable from his part in the independence movement of our country, which often in my mind merges with our present struggle for democracy that has not yet come to an end. In spite of the strong ties of love, temperament and blood between his father and himself, or perhaps because of it, Jawaharlal Nehru was able to accept Gandhi as a father also, a political, spiritual father whom he could regard as the light of the people of India. The nature of such political, spiritual kinship binds us with a fastness difficult to put into words, as cold as calculation (“we fall unless we stick together”) and warmer than any personal passion (“we need one another to keep the core of our being intact”). And the loved the sorrows of your changing face. Ann omitted the last line, perhaps because she considered it inauspicious, but I am including it because the whole adds up to a most moving testament to friendship. To be loved for one’s questing spirit is to be loved in the best possible way and to be given understanding and support through the hardships of a long struggle is never to be alone. Today, as I thank all of you for honouring me with the Jawaharlal Nehru Memorial Prize, I would like to express my deep appreciation for the leaders of India who became my most precious friends because their lives helped me to find my way through uncharted terrain. The discovery of Nehru was also a discovery of myself.